There is ample evidence of global climate change, these are just a few examples (here, here, here). While global indicators are important to focus attention on the problem and solutions, local data is important to help us understand the situation in our own areas. There are a number of R packages that let users download and analyze weather data to investigate the climate change situation in local geographic areas. I find the weatherData package an excellent tool for local climate change investigations. AS an example, I downloaded daily weather data for my local airport for the period 1950 – 2015, ran a simple r-script to count and save the number of 90+ days each summer period to a csv file. 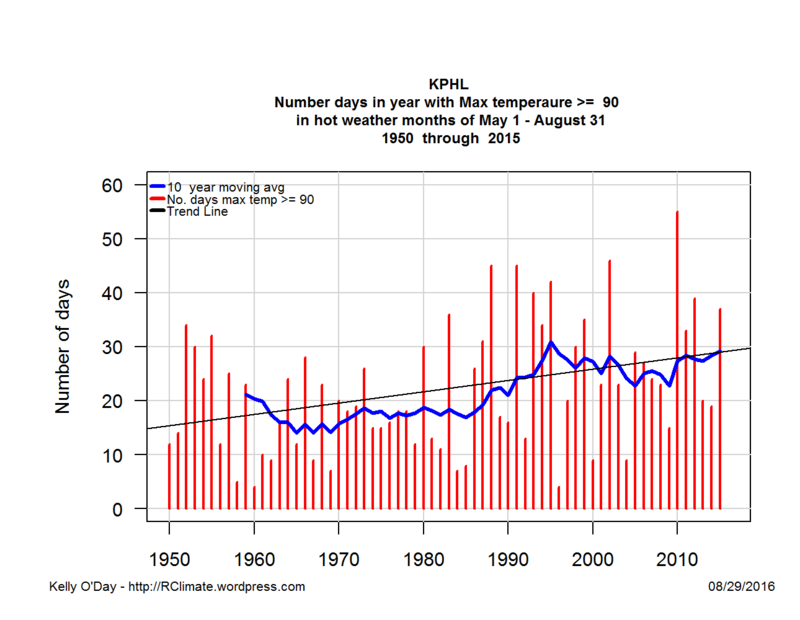 This hot day trend chart is an example of what R users can do to visualize the changing climate. This chart shows that the number of 90+ days in Philadelphia has increased in the past 66 years. Prior to 1983 (midpoint of period), only 5 out of 30 years have 30 or more days of 90+ max temperatures. Since 1984, 13 of 36 years had 30 or more days of 90+ max temperatures. 2016 has had 38 days through August 28, making 16 of 37 years with 30 or more 90+ days. My R script is reproduced below. My R base graphics script could be easily reproduced in ggplot2. input_file <-  "F:\\enter input file name.csv"